This is the very question many people are asking about the Muslim Brotherhood following the Egyptian Revolution of January 25, 2011. While the world was enthralled by a peaceful youth movement to overthrow a corrupt regime, many feared then, and more fear now, that the aftermath will result in national leadership in the hands of Islamists, led by the Muslim Brotherhood. Some believe the Brotherhood will transform Egypt into a theocratic state as in Iran. Others believe the movement is largely moderate, compatible with a modern democratic state. Some Muslim Brothers speak of a return to a caliphate; others speak of human rights and religious freedom. Are some stuck in the past? Do others obscure their ultimate goals? Who are they, and what do they want? For this reason I have wished to speak to you about the definition of Islam and its ideal picture in the souls of the Muslim Brothers, so that the foundations of which we call for, take pride in, and seek the expansion of, may be completely clear. The booklet newly gathering his thoughts was published in April 2011, thus reflecting an effort, at least on the part of some Muslim Brothers, to make clear once again the principles of the group following the revolution. It was presented to the author of this text while attending ‘Tuesday Conversations’ at the Omar ibn al-‘As Mosque in Old Cairo. A helpful young member of the organization selected it from a wide variety of books made available at the entrance to the mosque. ‘Tuesday Conversations’ was a weekly public lecture conducted by al-Banna until it was forbidden by the government in 1948. General Guide Mohamed Badie re-launched the session under the slogan, “Listen to Us, not about Us.” This is fitting with al-Banna’s original desire to present a clear image of the Brotherhood. The booklet is divided into two sections. The first is a general introduction to understanding the call of the Muslim Brotherhood, while the second is a more specific treatment of its definition, end, goals, means, etc. This text will provide summaries of each section which represent loose translations of the content. It will also provide direct quotes in italics, especially in areas that appear more provocative and need further explanation. The text will follow the outline provided by the booklet. One caveat to present the reader before beginning: The Muslim Brotherhood is a flexible and evolutionary organization which has consistently changed with the times. That the information which follows is drawn from its founder and re-presented is a fair indication this vision still drives the organization. Yet it must be emphasized the current leadership may have moved on from certain statements or understandings its founder possessed, which were forged in the period of European colonialism. This can only be assessed through monitoring their statements and direct questioning in interviews, which will hopefully be possible in the days to come. They interact according to what people want to hear, and maybe some of them are sincere in their kind words. But we judge them according to their books, by what is written. 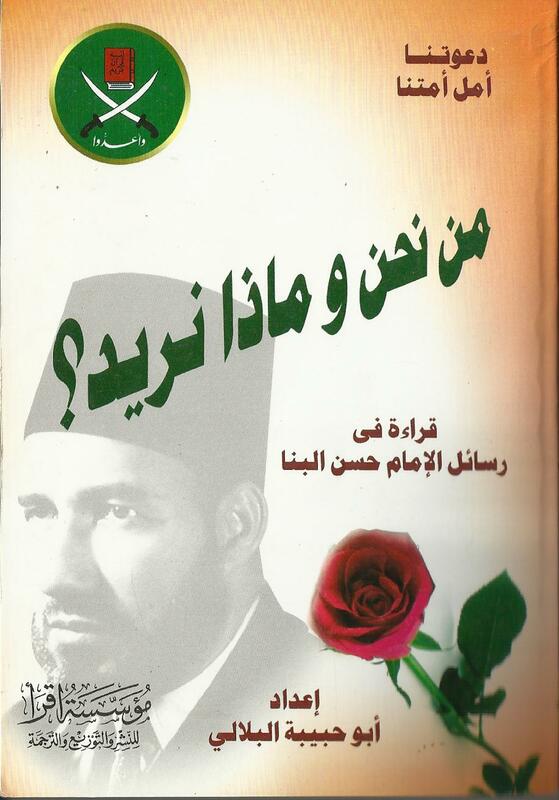 This text is an effort to present one example of what is written and distributed by the Muslim Brotherhood. Many people misunderstand both Islam and the Muslim Brotherhood. Some think of Islam as rules for worship and the provision of serenity in life. Others view it as a system of virtue and avoiding vice, while others think it is an inherited, backward tradition. As for the Brotherhood, some see it as a preaching organization for prosperity in this life and reminders of the next. Others view it as a Sufi organization promoting self-denial. a) We believe Islam incorporates all things to organize life in this world and the next: Doctrine and worship, nation and nationality, religion and state, spirituality and work, and Quran and the sword. b) We follow the Quran and the Sunna as practiced by the followers of Muhammad and those who followed them. c) Islam organizes all of life for all peoples at all times. In times past Islam came under the powers of the infidel world, so that it and its empire grew weaker and lost its meaning. The theoretical part of our call is to show people clearly the pure Islam; the practical part is to ask them to carry it out. To this we will strive, calling people to the task, expending everything for its sake, so that we live nobly either in life or in death. Our slogan: God is our end, the Apostle is our leader, the Quran is our constitution, jihad is our way, and death is the path of God is our highest hope. The Quran is the measure by which we judge our call and our goals in life. It teaches that some people seek food or riches, or even to spread trouble and evil. But the Muslim’s goal is higher: It is to guide people to the good, giving them the light of Islam. Therefore, the Quran has made Muslims to be the guardians for an incapable humanity, giving them the right of superintendence and sovereignty over the world. This is in service to our noble teachings and is our business, not that of the West; for the civilization of Islam, and not the civilization of materialism. Muslims should expend themselves in sacrifice for this call, and not profit from it. As they do they create civilization, unlike Western imperialism, which promotes desires and cravings. It is necessary we make this clear and specify it, and I think we have arrived to a place of clarity and agreed: Our duty is to have sovereignty over the world and to guide humanity to the good ways of Islam and its teachings, which alone can make a man happy. The essence of the Muslim Brotherhood is to explain carefully the call of the Quran in its entirety, in accordance with the modern age. We seek to win hearts and souls to the principles of the Quran, so that we may renew our heritage and bring all Islamic viewpoints closer together. We seek to develop and liberate the national wealth, raising standards of living, achieving social justice and security for all citizens, combating ignorance, sickness, poverty, and vice. We wish to liberate Egypt and all Arab and Islamic lands from foreign control. We will support Arab unity and the Islamic league. We will establish a state which implements practically the regulations and teachings of Islam, protecting them domestically and publishing them abroad. We will support global cooperation in protection of rights and freedoms, to promote peace in the balance between faith and the material world. The goal of the Brotherhood is to create a new generation of believers from the teachings of Islam, in order to give the nations a complete Islamic imprint in all aspects of life. Ruling the world, guiding all of humanity to the ways and teachings of Islam, which alone can make people happy. For too long the civilization of materialism has divided the Muslim peoples and retarded their progress. It stands against them and the leadership of the Prophet, denying the light of Islam to the world. We do not stand for this, but will pursue them and raid in their own lands, until the entire world celebrates the name of the Prophet and the teachings of the Quran. The shade of Islam will cover the earth, and then what the Muslim desires will be achieved: No sedition and all religion will be for God. Our program has clear and specific stages and steps, since we know exactly what we want and the means by which to achieve it. First, a Muslim man, clear in his thought, doctrine, morals, sympathies, work, and behavior. Second, a Muslim house, in the areas above but we care also for the women as we do for the men, and for children as we do for youth. This is how we shape the family. Third, a Muslim people, so that our message is heard in every village, district, and city. Fourth, a Muslim government, which will lead the people to prayer and the guidance of Islam, as did the Companions of the Prophet and the caliphs Abu Bakr and Omar. We recognize no system of government that does not emerge from the foundation of Islam. We recognize no political parties or traditional forms which the infidels and enemies of Islam have forced upon us. We will work to revive the Islamic system of rule in all its forms, and we will shape an Islamic government from this system. Fifth, an Islamic nation, desiring every part of the Islamic world to join with us, which was previously divided by Western politics and whose unity was weakened by European colonialism. We do not recognize these political divisions and will not submit to these international agreements which turned the Islamic nation into weak, torn apart, tiny states, easily swallowed by usurpers. We will not be silent as these peoples’ freedom is digested by autocrats. Egypt, Syria, Iraq, the Hijaz, Yemen, Tripoli, Tunisia, Algeria, Marrakesh, and all lands where Muslims say ‘There is no god but God’ – these are one large nation which we aim to liberate, rescue, and save, incorporating its parts one with the other. If the German Reich forced itself as a protector of all who had German blood, then Islamic doctrine obliges every strong Muslim to consider himself a protector of all who imbibe the teachings of the Quran. It is not possible in Islam for the racial factor to be more powerful than the factor of faith. Doctrine is everything in Islam, for what is faith except love and hatred? Sixth, we desire the flag of God to fly high over the lands which once enjoyed Islam and the call of prayer declaring ‘God is great’, but then returned to unbelief. Andalusia, Sicily, the Balkans, southern Italy, and the islands of the Mediterranean were all Islamic colonies and must return to the bosom of Islam. If Mussolini saw as his right to recreate the Roman Empire, whose so-called ancient empire was built on nothing but avarice and pleasure, then it is within our right to restore the glory of the Islamic Empire which was founded on justice, fairness, and spreading light and guidance to the people. Those incapable cowards who suppose this is all fantasy or dreams are simply suffering from weakness of faith that God has cast into the hearts of Islam’s enemies. We announce clearly that every Muslim who does not believe in this program and work for its realization will have no fortune in Islam. Those who follow this path possess a faith that cannot be shaken, confidence in God that cannot grow weak, and souls which rejoice most in their martyrdom. Furthermore, they possess great psychological power, having a strong will, firm loyalty, great sacrifice, and knowledge of faith. They implement the Quranic verse which states: God will not change a people until they change themselves. It is true that speeches, lectures, money and other means may help identify an illness and proscribe a cure, but the only means to solve it are through deep faith, precise strengthening, and continuing work. First, spreading our call and convincing people of it until it becomes the general opinion. Second, using all proper elements necessary to strengthen the firm support for reform. Third, engaging in a constitutional struggle until our call is supported by official professional clubs and the executive powers. Then, when the time is right, we will nominate ourselves for parliamentary bodies. We will not deviate from these means unless we are forced to, but we will not refrain from declaring our position openly without ambiguity, ready to bear the results of our work. When the apostles give up hope and think that they were treated as liars, there reaches them Our help, and those whom We will are delivered into safety. But never will be warded off our punishment from those who are in sin. 1) Islam is a complete order of life, inclusive of state and nation, government and people, creation and power, mercy and justice, culture and law, science and jurisdiction, material and resources, earning and wealth, jihad and preaching, army and idea, trustworthy doctrine and true worship. 2) The Quran and Hadith are the reference for every Muslim. 3) Faith and worship give light and sweetness, but illumination, impressed ideas, and visions are not part of Islamic principles. 4) Amulets and sorcery must be fought against. 5) The teaching about the imam and the one who stands for him is not based on Islamic texts, and opinions about this always change. 6) We accept all that the earliest Muslims did which fits with the Quran and Hadith, but we do not oppose those who view things differently. 7) Everyone who does not possess sufficient standing in religion should follow an imam until he does. 8) Differences in subordinate matters should not divide Muslims. 9) Be careful about discussion of matters which often descend into minutia. 10) The most sublime Islamic doctrines are the knowledge of God, his unity, and his transparency. 11) We must rid our faith of heresies, but in a proper way which does not lead to evil. 12) Certain matters between Muslims are for jurisprudence, examining them with proofs and evidence. 13) The early companions of Mohamed should not be criticized. 14) Do not adorn tombs of the deceased or call upon the help of departed saints. 15) It is wrong to call upon God’s help through the intercession of his creation. 16) Customs of a people should not change religious norms. 17) The basis of all work is our doctrine, which should push us toward perfection. 18) Islam frees the mind and enables modern science. 19) The opinion of sharia and the opinion of reason should not conflict with each other, though true science always submits to true doctrine. 20) We declare no Muslim to be an infidel, unless he speaks of his unbelief, or denies a fact of religion, or impugns the purity of the Quran, or explains it outside of what the tools of the Arabic language can accommodate, or behaves in a way unexplainable except by unbelief. The Muslim should continually work to reform himself, set straight his Muslim home, guide his society, and liberate his country from any foreign, non-Muslim political, economic, or spiritual power. He should work to reform his government until it becomes truly Islamic. Its members should be Muslims who perform the pillars of Islam and not those who willfully neglect them, to implement the regulations and teachings of Islam. It is permissible to seek the help of non-Muslims should this be necessary, but not in the positions of general authority, as long as he agrees on the general basis of the Islamic system of governance. The characteristics of this government are a feeling of subjection, kindness towards its subjects, just dealings with the people, keeping itself from the general wealth, and economy in working with it. The obligations of this government are the provision of security, making laws, promoting education, keeping itself strong, preserving general health, watching over the general interest, developing wealth, protecting capital, strengthening morals, and issuing the call to Islam. The rights of this government, when it performs its duties, include loyalty, obedience, and assistance through its people and their money. The Muslim should then work to restore the international position of the Islamic nation, so that its lands are liberated and its glory revived in the return of the lost caliphate and all desired unity. Fight them until there is no sedition, and all of religion is for God. Propagation, definition, and preaching the idea so it is received by the masses in all classes of people. Empowerment, selecting helpers, preparing soldiers, and outfitting the troops among those who are called. Many times these three stages can work simultaneously. The preacher calls to Islam, while he also chooses people and educates them, while he also works to implement the goals. Following the practice of these three groups is also a key distinction of the Muslim party called Salafi, though it is not restricted to them alone. The term jihad incorporates an idea of ‘striving’, of which violence and warfare are possible but not necessarily implied. The designation of ‘modern age’ moves the Brotherhood beyond the aforementioned Salafis, who generally speaking reject philosophical world advancements in favor of the original vision of Mohamed and his companions. The Red Sea coastal region of present day Saudi Arabia, within which are the holy cities of Mecca and Medina. Designating the lands of Spain and Portugal, where Islam ruled for 800 years. Representing a prominent teaching of Shi’ism. Representing a practice among some Sufis and traditional Muslims. It appears these military allusions are symbolic rather than a call for militias, but further clarification is necessary. And women? Have they any standing? That’s a complicated question for the Brotherhood at large. They are fielding women candidates in elections. But the selections from the book which informed this post spoke very little about them at all, either positive or negative. And for this purpose Quran has explained every aspect of life for Us.